ColorPic is a free Windows program, being part of the category Design & photography software with subcategory Web Design (more specifically Color Coding) and has been created by Iconico. It's available for users with the operating system Windows 2000 and prior versions, and you can get it in English. The program version is 4.1 and it has been updated on 1/10/2006. Since the program joined our selection of software and apps in 2006, it has already achieved 25.940 downloads, and last week it gained 84 downloads. ColorPic is a not that heavy program that doesn't take up as much space than the average program in the section Design & photography software. It's a software very heavily used in India, United States, and Germany. This is the best. 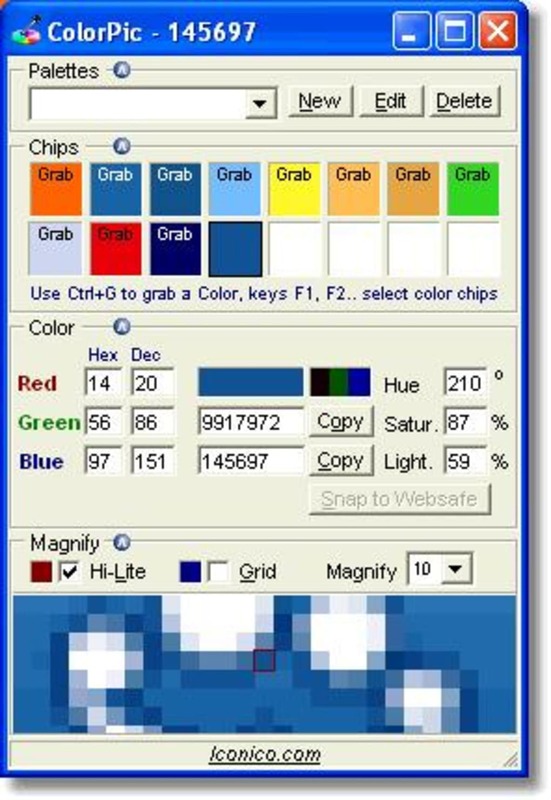 I could not have found a better choice of color pick software than this one. It is small &amp; has so many features, that it amazes me. The magnifier lets you snag the exact block you want by using the arrow keys on your keyboard. What do you think about ColorPic? Do you recommend it? Why?